In November, international experts and officials gathered in the capital of Tajikistan to discuss the country’s obligations in the telecommunications sector under its recently minted World Trade Organization membership status. Just over a month later, President Emomali Rahmon signed a decree that industry insiders argue could kill off competition and make a mockery of the country’s WTO commitments. In its latest effort to fasten its grip over the flow of information in and out of the country, the government has established an agency called the “Unified Electronic Communications Switching Center,” abbreviated as EKTs in Russian. In crude terms, the system requires all traffic — be it from mobile phones or the Internet — to be filtered through a network gateway run by state-owned telecommunications company Tojiktelecom. “Implementation of the decree is obligatory for all domestic entities active in the electronic communications sector,” the decree states. The idea of creating a government-administered information gateway has been circulating since 2005. The stated aim of the recurring initiative has been to prevent “illegal” communications that could undermine national security. Communicating with relatives abroad is a valuable emotional lifeline for many Tajiks, especially the vast legion of labor migrants abroad. More than 1 million Tajiks are estimated to travel to Russia to obtain jobs that are sorely lacking inside their own country. Definitions of what kind of content constitutes a threat to national security have been subject to sometimes extravagant interpretation. 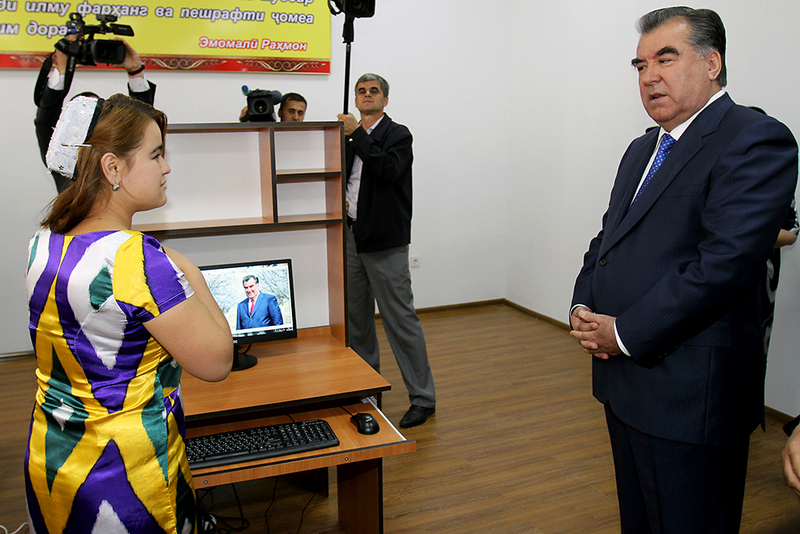 An article published in summer in the academic journal Demokratizatsiya entitled “Friends, Foes, and Facebook: Blocking the Internet in Tajikistan,” offers a detailed account of the government’s campaign to limit access to websites deemed problematic. Those efforts came in response to a perceived increase in discontented chatter in social media websites. “In the course of just three years, from 2012 to 2014, Tajikistan’s authorities evolved from maintaining a purely passive approach to imposing an assertive ‘networked authoritarianism’ that sought to repress the new freedoms the Internet provided,” according to the paper’s authors, Abdulfattoh Shafiev and Marintha Miles. Accordingly, websites carrying widely shared articles critical of the government were blocked, as were social media platforms being used to circulate them. In some instances, mobile phone networks have been partially deactivated. The creation of the EKTs marks a natural progression. Attempts to create such an agency were initially rebuffed by the antimonopoly service, which ruled, for reasons never clearly explained, that the system would create an uncompetitive environment. Tajikistan became the WTO’s 159th member in March 2013. Having overcome the accession hurdle, Tajikistan now appears set to renege on its pledges to ensure greater transparency and competition in the market. Justifying its change of course, the antimonopoly service has cited the mounting threat of terrorism and extremism. “You are aware of the increase in transnational threats. From the point of view of our security, it is necessary to control all electronic communication,” Nazar Odinazoda, first deputy chairman of the antimonopoly service, told EurasiaNet.org. And in another change of tune, the antimonopoly service now argues that the incoming arrangement will not, in fact, undermine legislation designed to encourage competition. Tojiktelecom, which oversees the EKTs, has its own Internet provider and mobile phone company, so suspicions are running high that it could use its gatekeeper role to its own advantage. Tojiktelecom’s Tojik Mobile service has to date largely been shunned by the market, unlike one of the big market players, the local subsidiary of Russian-owned Megafon, which is 25 percent owned by the government. The rest of the market is looking shaky as it is. In January 2015, market leader Babylon-Mobile suffered a major blow in a court ruling obliging the company to pay 350 million somoni (around $70 million at the exchange rate of that time) in purportedly unpaid taxes. And in September, scandal-tainted Swedish telecommunications giant TeliaSonera announced it was to gradually start divesting itself of its Eurasian assets, which include the popular T-Cell service in Tajikistan. Aside from shaping the market, the government appears intent on strictly vetting what information Tajiks are able to access. While instructions on blocking websites were previously issued informally to individual providers, which typically always fell in line, authorities will now be able to impose the blocks themselves, without offering prior warning or motivation. Security services will now also be in a prime position to intensify surveillance. The scale of government snooping is inevitably impossible to assess, but sources in the industry have indicated that authorities often exert pressure on companies into allowing them to monitor exchanges against the threat of losing their operating licenses. Some argue the scale of this issue is overstated. Gafur Irkayev, chairman of the Association of Mobile Communications Operators, said the government has, in any case, long been actively monitoring telephone and Internet communications, so the real problems may arise elsewhere. The creation of an unwieldy electronic communications-sifting mechanism will necessitate the assembly of a vast staff to manage it and entail considerable cost. “After this system is introduced, the cost of services will increase, since it is not clear who is going to be funding the switching center,” Irkayev said. Economist Konstantin Bondarenko noted that the ever-increasing volumes of transmitted information will pose a constant challenge for the EKTs system to ensure its capabilities keep pace with individual communications providers. That is sure to be expensive and complicated. “It is very likely the center’s equipment will be overloaded. And that means that many international calls from outside the country will not get through,” Bondarenko said. Concentrating all traffic through one node itself presents a security risk. In the event of a terrorist strike, hacker attack or even a major natural calamity, such as an earthquake, the switching center could be disabled, again isolating the whole country, Bondarenko said. There is a regional precedent for this model. Uzbekistan introduced a similar system, resulting, in part, with the cost of getting online becoming unaffordable for most residential customers. The prospect of a downturn in market competition and innovation represents a stark reversal in fortunes for Tajikistan. The country’s mobile operators began offering 3G mobile services in 2006 — making Tajikistan something of an outlier in the region. Some companies now even provide 4G, and yet Internet users have in the past few weeks reported a sharp drop in connection speeds. It is unclear if that drop in performance is related to the phasing in of the EKTs. Aside from the regulatory pressures at play, there are also signs that Tajiks are being forced offline by financial duress. The Communications Service reported earlier this month that the country’s mobile phone subscriber base fell by 1.2 million in 2015. The number of Internet subscribers dropped from 3.8 million to 3 million over the same period. Even the Communications Service was forced to admit that the declining economy was to blame. If costs for basic communication services go up, those figures are only likely to increase.